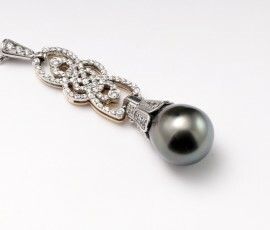 This necklace brings back a piece of the roaring twentys , a gorgeous art deco creation 18K White Gold with a fancy 18K yellow gold back gallery, black diamonds on top arch and white diamonds sprinkled throughout the the beatifully designed fillagree bringing it to life. 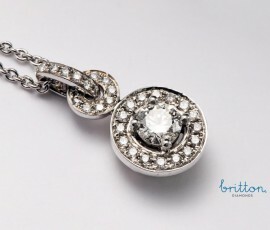 A beautifully crafted classic diamond pendant for all occasions. 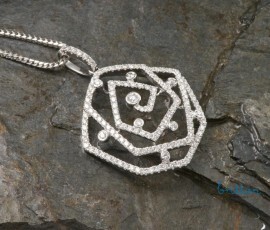 Center diamond available from 0.15ct and up. 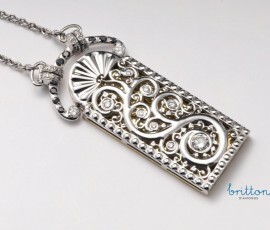 19K White Gold Pendant from Britton Diamonds flame collection, The center 1.16ct D Colour, VVS2 Clarity, Pear Shape Diamond surrounded in a playful pattern of paisleys, pave set with diamonds 144 = 1.55 carat total combined weight. 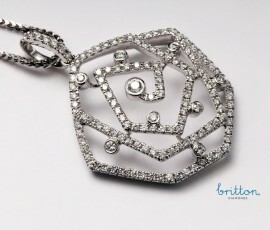 Our 18K white gold diamond pendant, appearing like bright stars in the sky forming an interesting array of constellations. 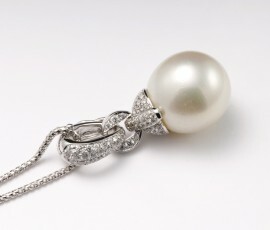 One hundred and forty diamonds with a combine weight of 1.21ct E/F Colour VS Clarity. Britton Diamonds Couture Collection, A mesmerizing Tanzanite proudly sitting in the middle of a tapering crown of scintillating brilliant cut diamonds. 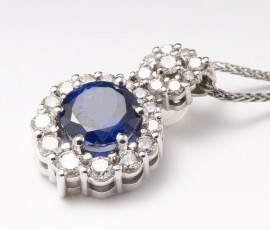 Pendant consists of a 3.65ct Gem Quality Tanzanite & Twenty-three Diamonds with a combined total weight of 1.41ct in 19K ultra white gold. 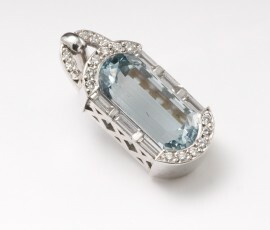 Britton Diamonds Couture Collection, Looking into this Aquamarine is like looking into the tranquility of the prettiest ocean imaginable. 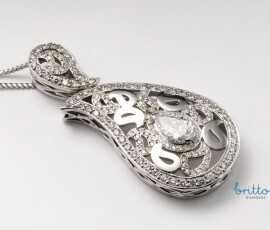 Pendant consists of a 6.41ct Aquamarine & Twenty-seven diamonds with a combined total weight of 0.66ct in 19K ultra white gold. 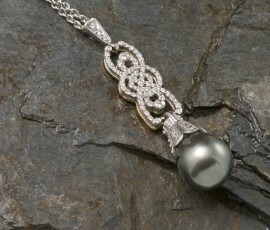 Natural Black Tahitian South Sea pearl and diamond 18K pendant, intricately designed and crafted to hold one of natures beautiful creations.